Having trouble sleeping? Pascoflair® can help! 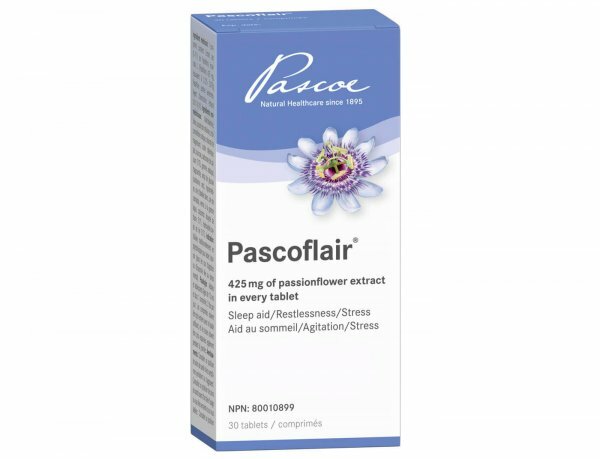 Pascoflair® from Pascoe, made with 425mg dry extract of passiflora incarnata (passionflower) per tablet, has the highest dose of Passionflower extract on the market. It naturally calms and declutters your mind, helping you fall asleep and stay sound asleep through the night. Pascoflair is traditionally used in herbal medicine as a sleep aid in cases of restlessness and insomnia due to mental stress. Passionflower (passiflora incarnata) is an herbal remedy, which has been known for centuries as an excellent treatment to help with sleep disturbances. It helps you sleep by turning off all the running thoughts which are going through your mind at bedtime. The mind can relax, which is then followed by the body, and as a result, sleep will follow. Having difficulties falling asleep at bedtime? Waking up frequently during the night and cannot fall asleep again? Feeling tired and grumpy throughout the day and having problems concentrating? A 2011 study from Laval University showed that 40% of Canadians have some form of sleep disorder. The most common sleep disorder is insomnia caused by stress. A good night’s sleep is essential to a positive and productive day. Lack of sleep may lead to impaired memory, reduced levels of concentration, and low physical performance which affects your ability to perform daily tasks. Experts believe that during sleep, nerve cells in the brain have a chance to repair themselves from extensive use during the day. Passionflower is one of the most powerful herbs used to treat mental health disorders. It is also one of the best-studied, with multiple studies in animals and humans as well as a long history of clinical use. Extracts from passionflower have also shown promise in the treatment of opiate (5), benzodiazepine (6), and nicotine withdrawal (7) in mice (6,7) and humans (5). The British Herbal Compendium indicates passionflower for sleep disorders, restlessness, nervous stress, and anxiety (6). Germany’s rigorous Commission E approved the use of passionflower for nervous restlessness (7). Pascoflair® from Pascoe won the 2009 “Apotheken-Award” for Natural Medicine - an honour chosen by German pharmacists each year for the best in natural medicine. 1. Grundmann et al. 2009. Pharmacy 64: 63-64. 2. Grundmann et al. 2008. Plant With 74: 1769-1773. 3. Dhawan et al. 2001. J Ethnopharmacol 78: 165-170. 4. Akhondzadeh et al. 2001. J Clin Pharm Ther 26: 363-367. 5. Dhawan et al. 2002. 7: 435-441. 6. British Herbal Medicine Association. 1996. British Herbal Pharmacopoeia (BHP). 7. Blumenthal 1998. The Complete German Commission E Monographs. Dry extract (5-7:1) of Passiflora incarnata L. 425 mg (passionflower), equivalent to 2.125g – 2.975g aerial parts. Adults, adolescents ≥ 13 years: 1 tablet, 2 times daily. Pascoflair® should be swallowed whole with sufficient liquid (preferably a glass of water), and the doses should be spread evenly throughout the day. Herbal remedy. Coated tablets. Active ingredient: dry extract of passion flower herb. Traditionally used in Herbal Medicine as a sleep aid (in cases of restlessness or insomnia due to mental stress). For risk information please refer to package insert and/or ask your health care practitioner. I took this when I flew to Vancouver on a red eye flight last week. I hate flying at night because I normally can't sleep on planes, no matter how tired I am. I took 2 of these and passed right out - right away! I woke up to the pilot announcing that we were landing. I felt so alert and well rested when I awoke. No grogginess that you get from other sleeping pills (and I have tried a lot! ), and no disorientation. I felt amazing as though I had 9 hours sleep. I will definitely buy this again, this stuff is amazing! I have been using Pascoflair for about 3 weeks now and I was skeptical at first about the effectiveness of a Homeopathic remedy but it does really work! I am able to shut down and my mind stops for a peaceful sleep ! Also during the day I feel more at ease. Thanks Pascoe !! I am highly stressed and my mind is just like the Energizer bunny, it just keeps going and going and going and I can’t shut it off, stray thoughts all the time. Pascoflair helped to shut off the mind so that I can focus on getting to sleep. Pascoflair work super fast to help you go to sleep. Even when you don't want to sleep, it helps to ease and calm your mind, making you feel serene. Will definitely buy again and have recommended to my family and friends. Thank you Pascoe!! I work night shifts and don't go to bed til way after the sun comes out, so sometimes it's hard to go to sleep. This stuff works really fast to shut off my brain and help me fall asleep, even with background noise and daylight. I wake up feeling well rested and alert. So glad I found Pascoflair, thank you Pascoe! I am very pleased with this product. I was reluctant to purchase at first. Been taking this for 3 months and it has been helping me calm down during the day without feeling the drowsiness effect. Will definitely purchase again. Pascoflair is a lifesaver! It works so quickly and helps me fall asleep when I can't turn off my mind. It even works during the day if I am feeling anxious or stressed - with no drowsy affect. LOVE this product! Thank you! We at Pascoe Canada pride ourselves in having the highest quality products, fast shipping and great shopping experience for all of our customers! And we love that you enjoy our newly redesigned site!